Home » Skin Care » What Is Lip Dermatitis or Eczema on the Lip? What Is Lip Dermatitis or Eczema on the Lip? Eczema on the lip is especially common in the dry, cold winter months. Also called lip dermatitis or eczematous cheilitis, it’s an inflammatory skin condition that flares up and can lead to itchy rashes or painful blisters on or around the lips. It can be particularly irritating due to the resulting pain and appearance, but also because it might be quite difficult to figure out its cause. Lip dermatitis can come from an existing skin condition, environmental irritants like the weather or lipstick, and allergies to food or product ingredients. Thankfully, eczema on your lips can be treated, so you can enjoy a better quality of life and give plenty of kisses (if you want to). What Causes Eczema on the Lips? There are a number of symptoms that can signify an eczema flare-up on your lips. You will generally find eczema around the lips and especially along the vermillion border, which is the noticeable line where the lips meet normal skin. The symptoms are much like those that would occur anywhere on the body when skin becomes dry or irritated. Change in pigmentation; fair-skinned people may notice reddish or brown discoloration, while darker skinned people may notice lighter or darker markings in the affected area. When an existing eczema condition flares up or you’re experiencing acute dryness caused by environmental factors, there are multiple treatments available. The best remedy for you will be determined by what is causing the dryness and how long you are willing to deal with it. There are both internal and external causes that lead to dry lips. You could have naturally dry or irritable skin that increases your risk for lip dermatitis. On the other hand, you may be frequently exposed to cold, dry temperatures that lead to freezing and cracking and eventually eczema on lips. Causes can help determine prevention and treatment methods, and therefore should be accurately identified. Some people have naturally dry skin, leaving it more susceptible to sensitivities. These individuals should put more effort into adequately moisturizing their skin to prevent symptoms. We’ll offer a host of moisturizing tips later on the article. Some may be best suited to talk to their doctor about pharmaceutical treatments. It is not completely understood why certain people are more likely to have dry skin, and it could be a combination of hereditary and environmental factors. These causes of dry skin are far easier to identify and can be manipulated to determine their influence on skin health. Weather: Extremely cold or hot temperatures, low humidity, and dry air can all contribute to dry, cracked, and irritable lips. Cosmetics: Lip sticks, lip balms, and lip liners can lead to irritation. Sometimes the reaction can be fueled by ingredients in the products, while other times, it can be a personal allergy or reaction. Allergies: Eating foods or using products with compounds you are allergic to can lead to skin irritation on and around the lips. Lip licking: Frequently licking your lips can dry them out. Not surprisingly, the most irritating part of dryness around lips is the symptoms. Thankfully, for most people, it is pretty easy to treat. Simply add and adequately maintain moisture in the area. Non-irritating lotions, lip balms, and moisturizers can help provide protection from the elements, and help repair dry, cracked, and painful lips. You can get a little added boost by applying them directly after a shower or face wash. Doing so will lock moisture into the lips to help the healing process and offer relief, but it is also important to carry such products around with you for easy re-application. If your lips are inflamed and swollen, looking for a lip cream that features one-percent hydrocortisone may help to bring it down. If you are noticing excessive inflammation and it seems to be a highly irritating recurring problem, pay a visit to your doctor to talk about further treatment options. There are a number of home remedies that can be effective for lip dermatitis, and can be used either independently or in addition to other treatments. Sugar can be used as a natural exfoliant to remove dead skin and encourage the growth of healthy new skin. To get these benefits, be sure you don’t eat it: It should be applied as a topical rub! Brown sugar is softer than white and better suited for use on the face and lips. To apply, combine some brown sugar with honey and lemon drops and apply twice per week. This acts a good moisturizer with the added benefit of having antibacterial properties. Applying some pure organic honey to the affected area throughout the day could help ease the symptoms of lip dermatitis and restore hydration. If you don’t want to apply regularly, it can be combined with glycerin and mixed into a paste to apply at night. This might not be the most accessible (or cost effective) treatment in the winter months, but it could be an effective treatment when your garden is in bloom. Pick a handful of rose petals, wash them thoroughly in cold water, and soak them in milk for two to three hours before mashing them into a paste. Applying the salve to your lips a few times a day could help. If you’re allergic to dairy, you can replace the milk with glycerin. Pure coconut oil and shea butter are great moisturizers that can be particularly helpful to ease pain and restore health in the lips. Apply two or three times per day. Much like coconut oil, castor oil is also a great natural moisturizer. Smearing a few drops onto your lips a couple of times a day may help speed up the healing. The high-fat content can provide good moisture to dry skin, and can be a rich and tasty treatment for eczema on the lips. To use it effectively, apply to your lips and let it sit for about 10 minutes. After the time is up, remove using warm water and a cotton ball. Do this once per day. Used for a variety of skin conditions, aloe vera can provide a soothing treatment for your lips. If you have a fresh aloe vera leaf, you can extract the gel and apply it directly to your lips. Otherwise, you can look for pure gel in your local health food store. Eating foods rich in vitamin A may improve the health of your skin, as could eating a variety of fruits, vegetables, and healthy fats. Carrots, mangoes, papaya, prunes, leafy greens, flax seeds, salmon, avocado, and nuts are all worth including. Limiting processed and refined foods can also be a major benefit. Keeping your lips moist: Use creams at night and in the morning and apply one or more of the remedies listed above throughout the day. Also avoid licking your lips, and when you’re out, keep some non-irritant lip balm or moisturizer in your pocket. Note reactions: If you notice flare-ups after eating particular foods or applying certain products, stop using them and see what happens. Also, make sure to read labels to identify any potential allergens in products. Try and avoid extreme weather: If you don’t have to go out on a super cold (or hot), dry, and windy day, then don’t. If you do, make sure to moisturize and pack some lip balm. Try to limit stress: Stress can lead to inflammation and flare-ups, so finding techniques that improve sleep and limit stress can help. Yoga, tai chi, meditation, and good sleep hygiene can help, as can a healthy diet low in processed foods and refined carbohydrates. 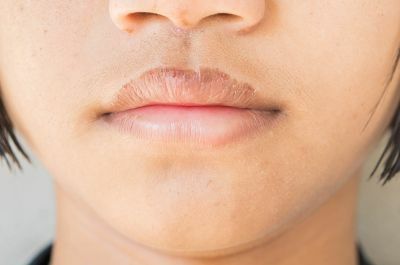 Lip dermatitis can be painfully irritating and cause all kinds of physical and social problems, but its symptoms can be short-lived if action is taken. Keep your lips moist and avoid irritants to get rid of eczema on your lips, so you can get back to kissing as quickly as possible!